So I’ve decided to take some time to talk a bit about one of my drawing processes (while I am terribly “busy” procrastinating!) For the drawing above and for a lot of my work, I use Mylar or drawing film as my drawing surface. I like it because it really lends itself to layering pencil marks, without degrading as a surface. I start a drawing with a loose sketch (which is where the image above is currently at). Then I focus on specific areas, drawing many lines over the form to create shape and three-dimensionality. 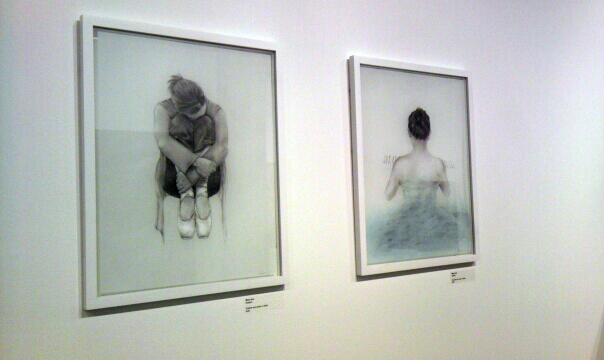 The pictures below are from a smaller drawing I did for a group exhibition last year. Afterwards I take a soft rag and go over those sections, shaping out and following the form, essentially wiping away most of what I have done. (Graphite sits quite loosely on Mylar and can be easily rubbed off.) I continue this process, adding lines, going over with my rag, and adding the highlights by erasing the graphite with a kneaded erasure. I move around the drawing, eventually adding tone to the entire composition. I know it might seem odd that I keep wiping off my drawing, but a little bit stays each time and the next layer sticks a bit more afterwards. It works for my style. The last step is going back with a sharp pencil and adding in details and contrast. What I have been experimenting with lately is adding fluid acrylic paint to these drawings. Since Mylar is somewhat opaque, I learned that painting the backside of my drawing shows through quite nicely. It is great for adding tonal contrast/added highlights, while keeping my line work intact. For the ballerina drawing I decide to add white acrylic to her ballet shoes. As you can see, the highlight it produces draws your eye to her shoes. For the drawing on the right, light layers of blue paint were added on top of my drawing.